Ever play telephone as a kid? Children pass a message, one to another, until the last person repeats it aloud. Invariably even the simplest message gets completely muddled by the end. If they could bottle it they’d sell it, and that’s what Telestrations attempts to do. The object of the game is to score the most points . . . if you’re into that sort of thing. Take one tablet and play it in the evening. Each player (four to eight can play) gets his own flip-tablet for drawing, an erasable pen, and a small eraser cloth for getting rid of all the ink when the game is over. Spiral bound, the “pad” has tabs at the bottom to keep people in mind of what round it is and what they’re currently supposed to be doing. Everyone draws a card from the deck provided and someone rolls the six-sided die so you know which of your card’s six secret words or phrases you’ll be drawing. That goes in the front of your booklet. Now folks are ready for job one, which is . . . Draw! The player has to sketch out his secret word, which invariably elicits cries of, “But I can’t draw!” Well, therein lies half the fun. If you could depict it with 100% accuracy there’d be no mystery for the next step, which is where everyone passes his tablet to the left and that player has to check the picture he was given and figure out what was drawn. He writes his guess down, then the group passes to the left again. Lather, rinse, repeat. Everyone alternates between drawing and guessing for eight rounds, and then and only then does everyone have a good laugh at just what terrible artists their friends are. Seriously, though, the results are usually far and away not what was expected or intended, and in this sense the game is really just a giddy pastime. But if you feel you need to determine who “won” . . . 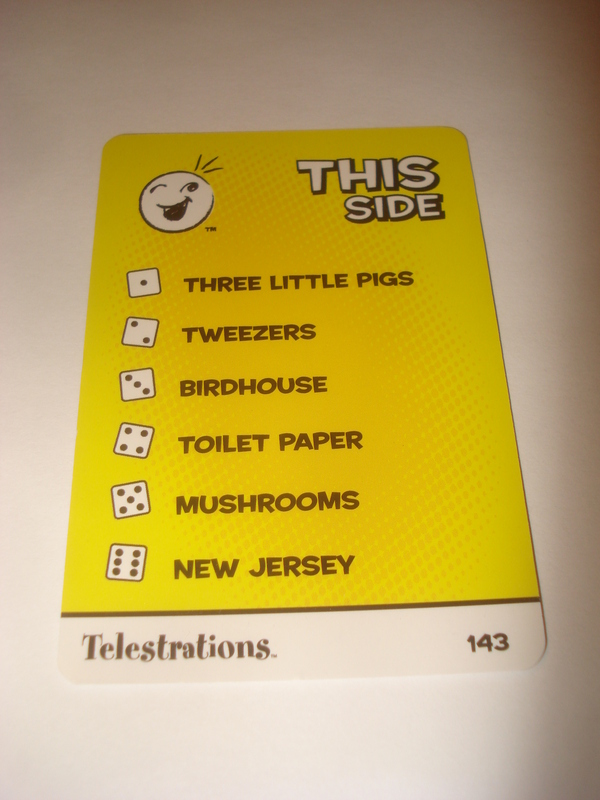 The included point systems play out over three games; the booklets have a page set aside for keeping score. After each game players examine the art and text in their own tablet, and assign points to others either for the efforts they enjoyed the most (if it’s a friendly game) or to those who drew or deduced correctly (using a purely competitive system). When the third game concludes, the person with the greatest knack for sussing out what their friends are trying to communicate earns the most points and wins. There’s no faulting the stuff you get in the box. The tablets are all miniature whiteboards; admittedly the area in which you have to create your masterpieces is small, but with the spiral binding, multiple pages, and tab system at the bottom, you’ve already gotten your money’s worth. 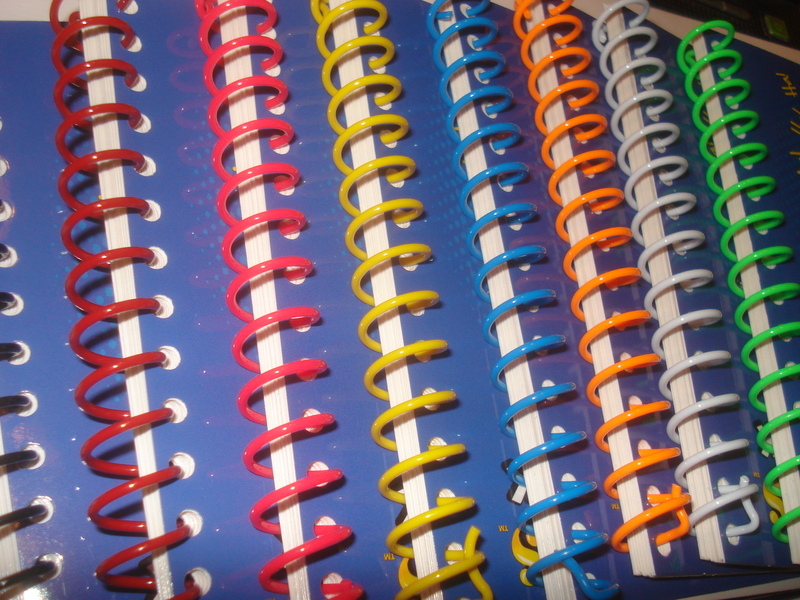 The plastic spirals are even different colors, to help track who’s responsible for which board (though the red and the . . . brown? . . . are nearly identical). A rainbow of flavors, in no particular order. The pens are also a little short, so adults may find them slightly harder to hold than will the little hands in the household, but hey, at least no one’s expecting you to field your own stationery. The cards are sturdy and their hard-cardboard holder isn’t too bad either. The six-sided die is pretty standard, but the sand timer is marvelously accurate. Finally, there is a set of small cloth “shammies” for erasing the pads. They’re thin, almost a whisper of a suggestion, but then you can erase the boards with pretty much anything. But hey, good luck with "New Jersey." And game play? Okay, so maybe this is the sort of thing the family can do around the dinner table with a few sheets of paper and a little less hand-holding, but USAopoly’s formalized version of the old pastime isn’t just a cheap gimmick to cash in. The attention to detail on the tablets is wonderful: It saves on time and materials; the flip-book arrangement of pages makes sure there’s only one secret per panel; and most of the important things to know are printed right there as you go. And certainly, providing space enough at the table for eight is generous. They suggest flipping the pages over so no one sees what you’re passing to the next person – frankly it’s probably an unnecessary step since, if you can not only make out what other people in the game are passing but can work out what it is, you’re already some sort of savant. But hey, at least you have the option of super-secrecy. Having the card deck and its random element enter the equation levels the playing field a bit so no one has to come up with their own topics (and prevents folks from writing down something utterly outlandish). 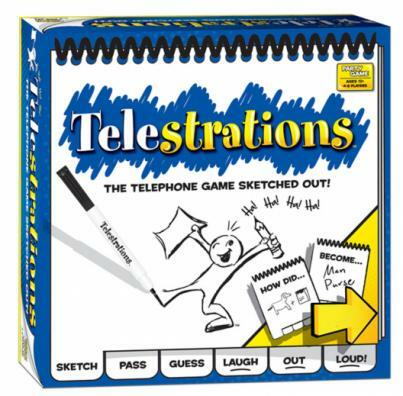 Not to mention there aren’t many old social games that translate as well as Telestrations (you probably won’t be seeing Hide ‘n’ Seek on your local gaming shop’s shelves any time soon). The addition of a physical element to the festivities gives players something tactile to cling to and invests them in the action, and the points system gives it, well, a point, if you think that’s necessary to fan the flames of rivalry in your group. 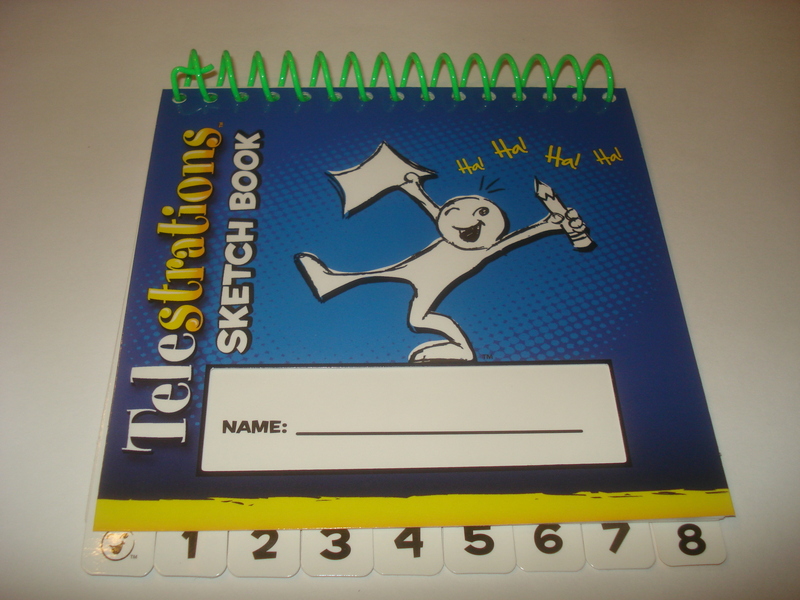 It does its part to raise the level of the cute stories one gets to tell about life around the tabletop, and Telestrations literally keeps everyone on the same page.